You have the choice of booking either the upstairs or downstairs apartments or the entire Grandview House. Grandview House (circa 1910), is a fully restored, two storey seaside residence situated at South Australia's premier beachside resort location, Glenelg. Featuring two spacious, fully self-contained house-sized apartments with 'olde world' charm, Grandview House offers luxurious modern conveniences. Each apartment provides two large bedrooms, a lounge with dining area, fully equipped kitchen, bathroom with shower, a two person spa-bath and laundry. The upstairs apartment has large private front and rear balconies. The front balcony overlooks the picturesque Colley Reserve and offers magnificent sea views and glimpses of the Marina. Downstairs, the apartment has a front porch that provides views of Colley Reserve and a rear verandah with its own outdoor setting and barbeque. 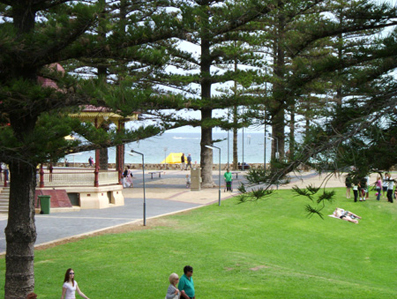 Grandview House, is only a minutes walk to the famous cosmopolitan Jetty Road where you can board the historic or modern Glenelg tram and travel to the City, enjoy the seven day shopping, wine and dine at a myriad of restaurants, relax in a sidewalk caf�, watch a movie at the local cinema, or have fun at one of the entertainment venues. 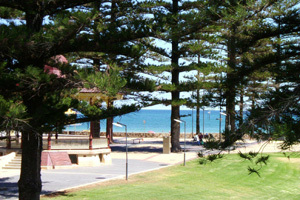 A short stroll takes you to : the new Holdfast Shores Marina, the beach for a swim, the Jetty, the Beachouse, local library & playground, the Stamford Grand, as well as many other attractions Glenelg has to offer. Floor plans are not to scale, to be used for representation purposes only. Please note that reduced rates may apply for longer stays. Please note: No-smoking permitted inside, smoking outside only. No pets allowed. Breakfast provisions can be supplied at an extra cost in any of our holiday apartments located in the coastal suburb of Glenelg. We value our guests and like to pamper to their needs, therefore offer the alternative option of a (Non-Hosted) Bed and Breakfast accommodation experience. Please request this option at time of making booking. Gift Vouchers can be arranged: For a specific apartment chosen by you, or left open for the recipient to choose their own favourite getaway! Personal designed packages can be arranged: Wine, chocolates or pantry items might wish to be included. Our aim is to listen to your personalised accommodation requirements and tailor a package/rate to suit you. Please contact the manager, Anita McDonald with specific dates to obtain the tariff. Contact can be made via email: grandviewhouse@bigpond.com or by using our Booking Enquiry Form to assist us with your enquiry. Rates are quoted in Australian Dollars and are inclusive of all taxes (where applicable). If you require breakfast provisions to be supplied, please request this option at time of making the booking. Rates are based upon: length of stay, season and servicing requirements. A 50% deposit is required to secure the booking and the balance is to be paid either on or before the arrival day. Access to Grandview House is either from Colley Terrace or Durham Street. Entry to an undercover car park is only from Durham Street. You will be met at the property for check-in no earlier than 2:30 pm on your date of arrival, unless otherwise arranged. Final and full payment is due at time of arrival. Regarding check in, could you please phone Anita's mobile: 0411 102 773 about 20 - 30 minutes prior to check in. You will be met at the apartment and shown how everything operates, handed the keys and the balance will be finalised. Kindly check-out no later than 10:00 am on your date of departure, unless otherwise arranged. Please remember to leave keys and the garage remote inside apartment. Please note we try to be flexible with times to fit in with your travel arrangements. Cancellations notified more than 30 days prior to arrival day will be entitled to a full refund. Cancellations notified 30 days or less prior to arrival day, will forfeit all monies paid unless we are able to rebook your entire stay to another group at full tariff. Cancellations made due to unforseen reasons, may have the option for us to hold all monies in credit against a future booking to be taken within a time frame that is mutually agreed upon by both parties. If the future booking is not taken within the agreed time then all monies paid will be forfeited. We recommend you take out travel insurance to provide protection against loss due to illness, injury, death, loss of luggage and cancellation of travel.